AGRA Stamped Concrete Specialists takes pride in every concrete pour it makes whether it be a pool deck, patio, sidewalk or basement for one our residential customers in Chester County, PA. 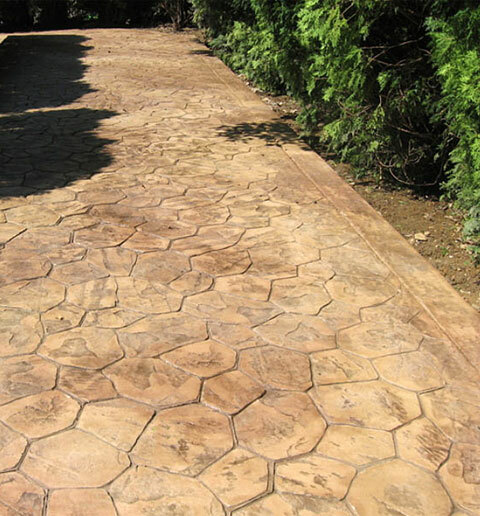 Stamped concrete has become more popular over the last few years in all areas of construction. Stamped concrete has become a more cost effective and longer lasting substitute for other hardscape materials such as brick pavers or cobblestone. Since stamped concrete is a solid mass it is less likely to lift over time, as pavers are likely to do. AGRA Stamped Concrete, based in Chester County, makes its Stamped Concrete by using a liquid, iron oxide integral color. This is an important difference! Most concrete contractors use less expensive ‘shake on’ powder colors. Shake on colors can be uneven, can chip (exposing plain concrete) and can cause inconsistency in shading from section to section. AGRA Concrete Specialists delivers concrete pre-mixed and colored. Should your job require more then 10 yards of concrete, our mix proportions are exact and each truck will pour the same color, no matter how big the job. With over 70 colors available and so many stamped concrete patterns we can make your dream project come true. Driveways, walkways, pool decks – from a London Cobble for sidewalks to a wood pattern for a residential basement slab – AGRA Concrete Specialists works to assure your complete satisfaction. Concrete projects, regardless of size, receive the same level of expertise and attention. The owner of AGRA Concrete Specialists is on-site for EVERY project. This is an absolute. The company is owned and operated by James Boyd and each customer receives his personal consultation and comprehensive expertise on their project.What makes AGRA Concrete Specialists different? We ask for no money up-front and all estimates are absolutely free. We are fully insured. While competitive, we do not claim to be the least expensive concrete contractor. Our use of the highest quality concrete, integral color (rather then shake on powder) and our 29-years of experience has taught us that good work lasts and that cutting corners is NEVER a good idea. At AGRA Concrete Specialists we pride ourselves on three things: honesty, integrity and dependability. Many of our customers have agreed to let us use pictures and testimonials from the stamped concrete projects we have completed for them. The testimonials you will read are from customers throughout Chester County, Delaware County and Berks County. They are your neighbors and colleagues, and we will work as hard for you as we did for them. With AGRA Stamped Concrete Specialists you get the very best. We appreciate their business and look forward to speaking with you regarding concrete contracting or stamped concrete.